After almost three weeks of city life (77Dow excitement + work), as summer weather turned noticeably to fall, and missing the bigger swells that rolled through, we made it down to the beach this morning when it had returned to small 1-3′ and fair with low wind and sunny skies. Pulled up to the beach and ocean was so blue, looking so expansive. Out in the lineup, a silent orchestra of surfers darted about the lineup, going right of left, paddling back out, avoiding one another, getting cleaned up on the inside as an outside set broke – all without any verbal communication. After being away from the beach for so long (for me) it all seemed rather foreign but the overwhelming feeling was one of peacefulness and awe. Back on the Mitsu for the first time since Woody fixed it! I was off-position on the board, too far forward after being on the 7’4. Took some adjusting and paddling felt wacky too at first. Got some short ones. Max started getting waves around me. We had drifted to the south end. Paddled back north where it looked better. When he went up to the beach, I had just caught my best left, swooping all the way into the inside kelp. Got two more outside lefts and a right while he was watching. So stoked! Chatted with Rick E and pretty much saw everyone surfing out in the water when we got there. Yay, beach life. 1-2 ft- ankle to knee high occ. 3 ft.
Howdy folks, this is Oliver with the report for Friday afternoon. 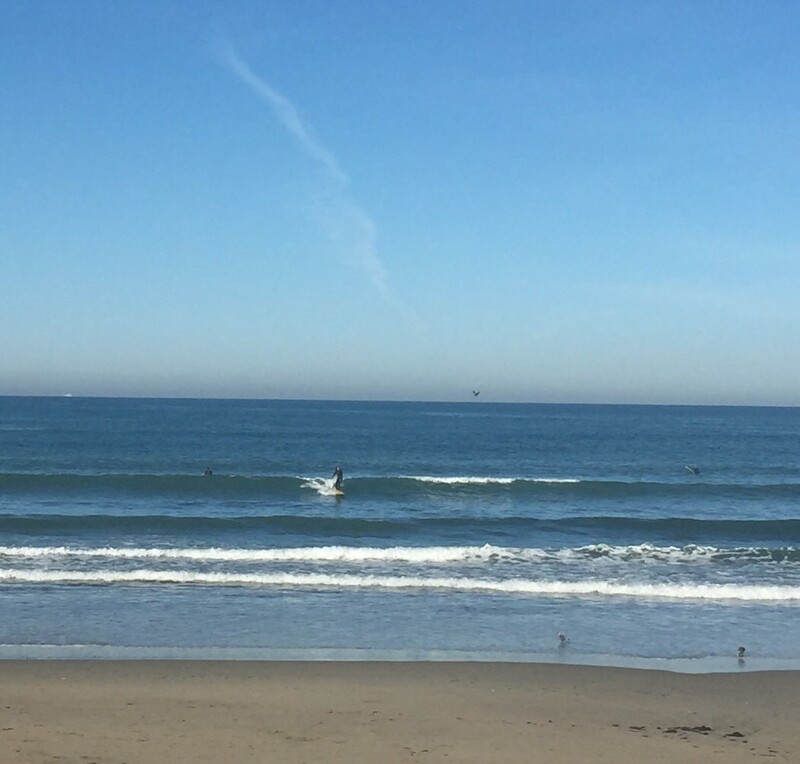 Afternoon Report for SF-San Mateo County: Small mix of NW and SW swell has surf in the waist high+ range for exposures. Best magnets see some chest high sets. Winds are moderate W now, adding texture to conditions. Tide dropped to a 1.5′ around 1:30PM.